Visiting The Georgia Aquarium | Where is Yvette? First off, you must realize it’s one thing to logically know that something is the biggest and best in the world in what it does, but it’s another thing to actually go and see it. This is similar to what you notice at Hartsfield-Jackson International Airport flying into Atlanta: of course you know it’s the biggest in the world, but your reaction while navigating the behemoth is still the fundamental one of “wow, isn’t this place big!” Which is true, of course, but isn’t particularly descriptive is it? Whale sharks are the largest fish in the world, and this is the only place you can see them outside Asia (these guys were airlifted from Taiwan, entertainingly enough via UPS). 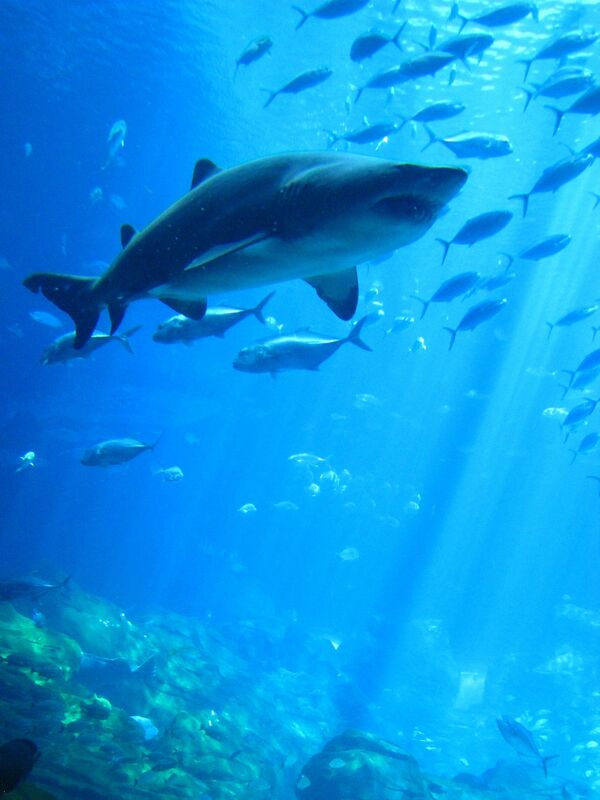 Their current tank is the largest fish tank in the world in its own right at 6.2 million gallons, and I’m drawn between whether the coolest part of it is the tunnel through it or the viewing panel as large as a movie theater screen. 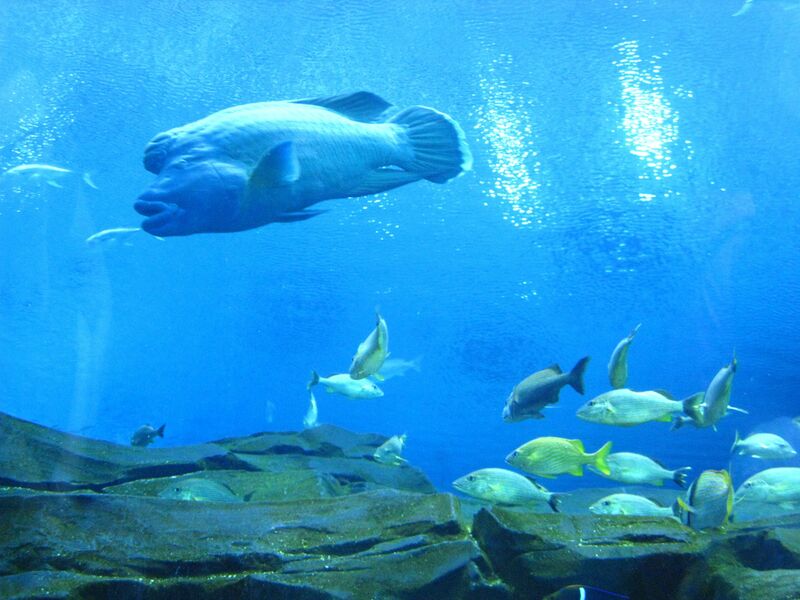 Pictures taken from inside the tunnel- that bad boy is obviously a great white shark, but the curious fellow in the picture below is a Maori wrasse. 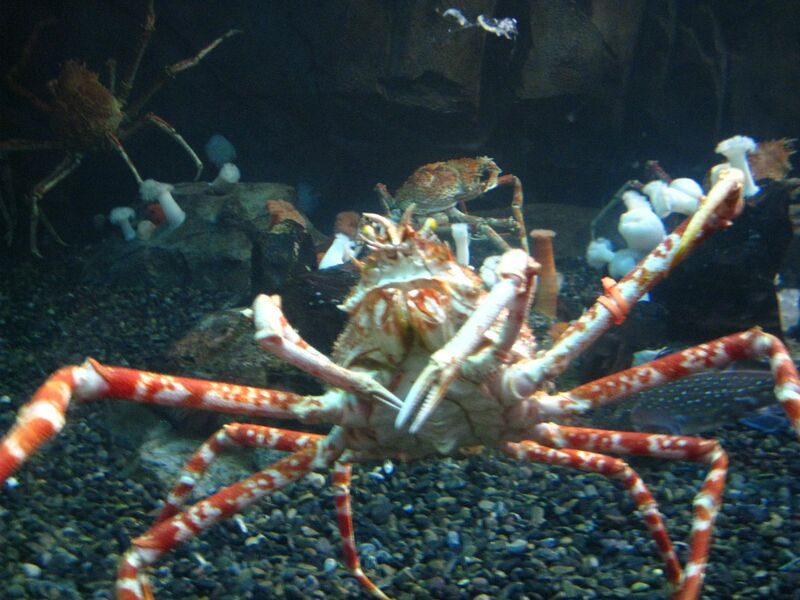 Probably one of the biggest I’ve ever seen, but then I suspect if you live in an aquarium and thus not worrying about getting food and predators and what not you’re free to grow big! 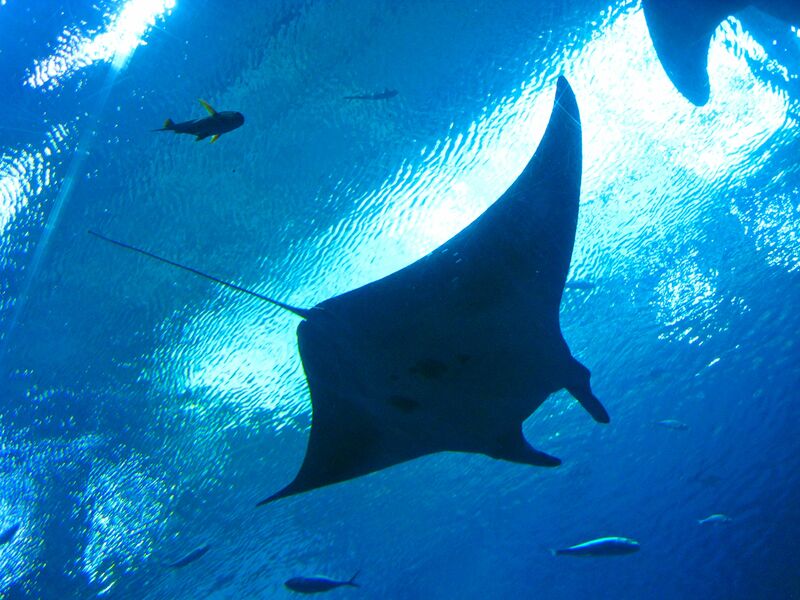 A manta ray swimming above us in the tunnel- one of the few places in the world they’re in captivity because of the giant size of a tank needed to hold them. The other reason I post this picture is so you can get an idea of how deep underwater the tunnel is- in short, it felt like I was as deep underwater as I was when scuba diving! 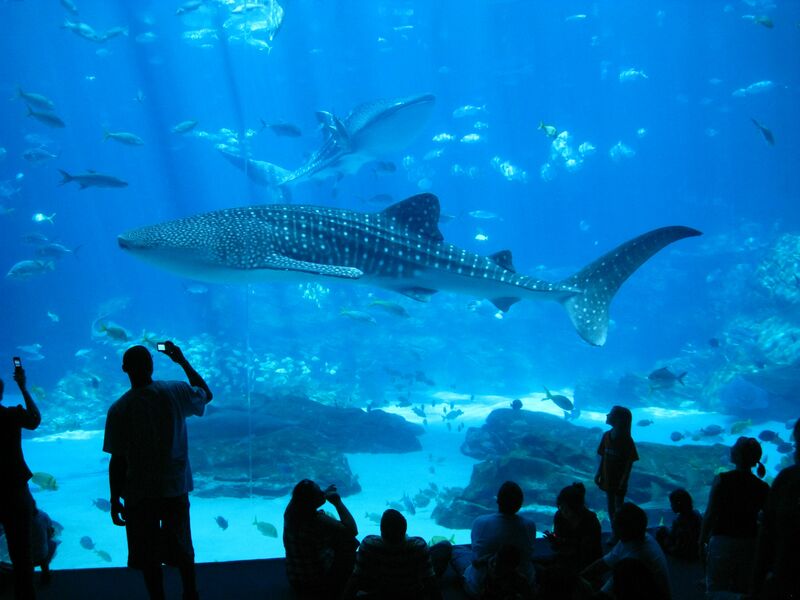 (If you have a few hundred dollars to spare you can go scuba diving in this tank actually- the only place you can do so in the world with whale sharks, because in the ocean many divers have died following the sharks too far down and succumbing to nitrogen narcosis. Here this isn’t a problem.) Truly awesome in the original, not-hijacked-by-teenagers sense of the word. Post-tunnel you get to check out the giant viewing area mentioned before, which is a perfect spot to sit and admire the whale sharks and the rest of the tank inhabitants. 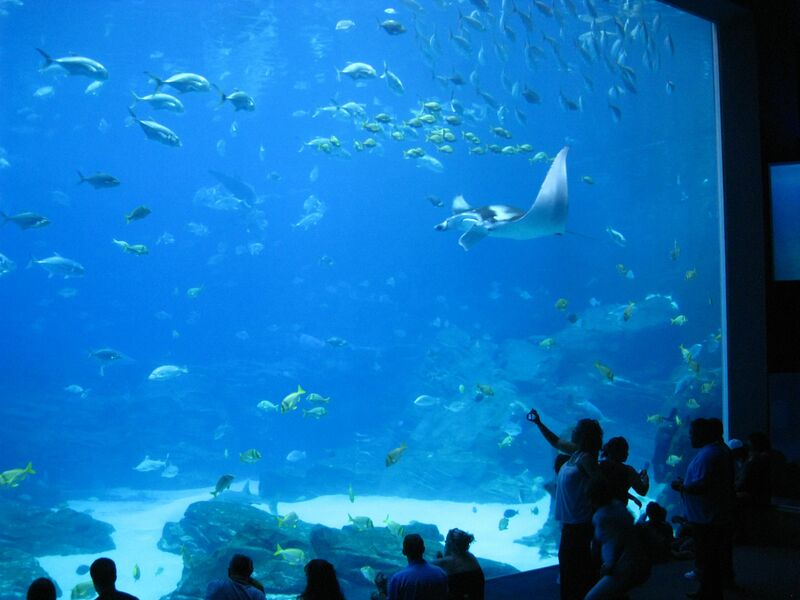 We came through here twice and stood transfixed both times- I think if I lived in Atlanta I would just get a Member Pass for a year and come hang out and stare at the tank an hour here or there, as it’s what you experience zoning out staring at your aquarium tank at home but a lot cooler. Or one of their sleepovers, where I’m told you can actually fall asleep viewing the tank! 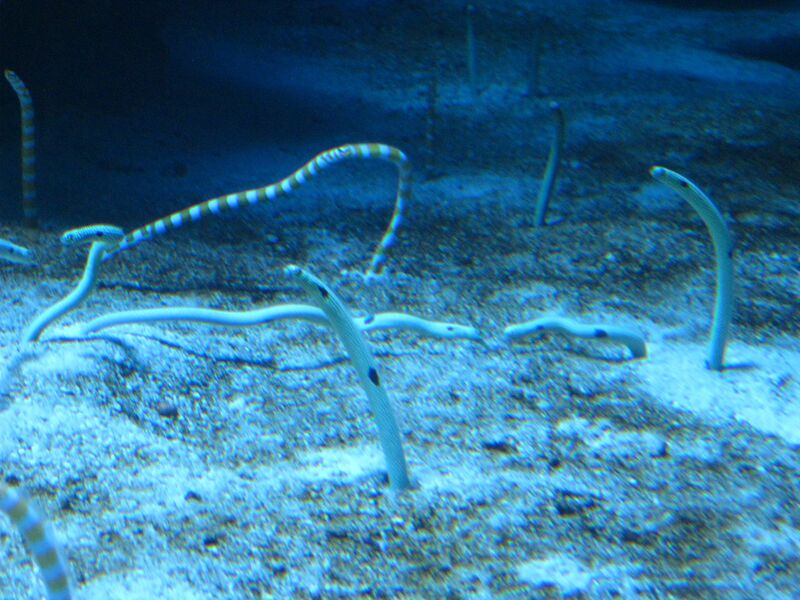 These guys are known as garden eels- I was trying to figure out if their colors were due to two different species being displayed here or just male vs female, anyone know? 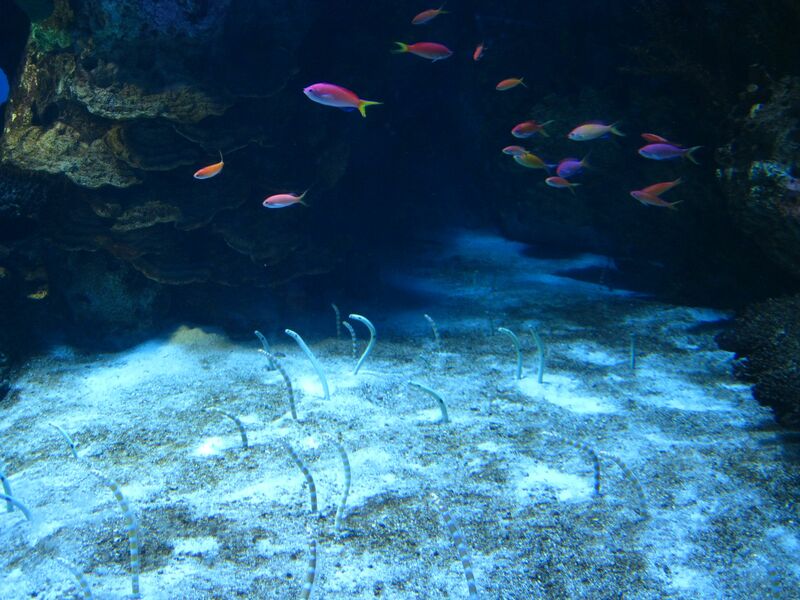 Anyway, these eels are very frightened of any fish swimming nearby them (or human, if you’re diving), but when there are no fish nearby they’d start to get further and further out of their holes and interact with each other. 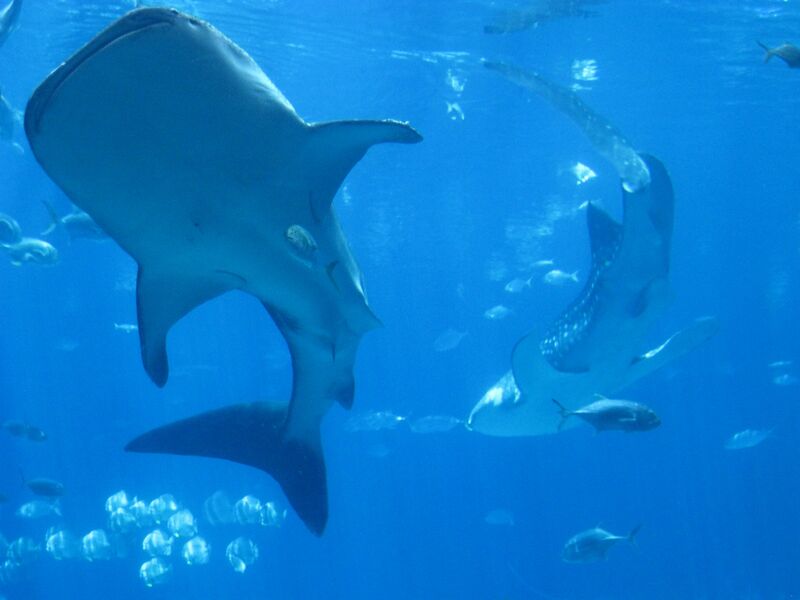 Super-cool, particularly because as a diver you would never get this close to observing them! 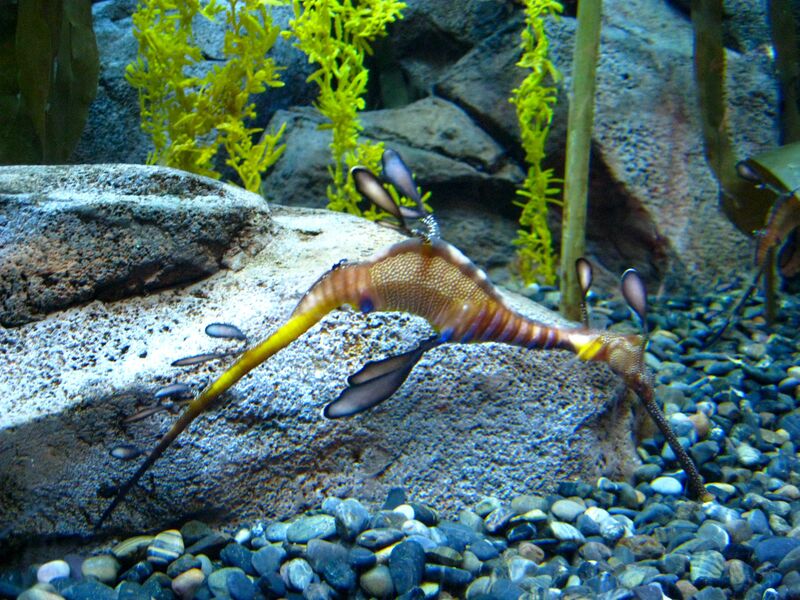 Another super hard to see while diving creature from the cold water exhibits, the sea dragon. Part great camouflage, part not moving much in the first place. 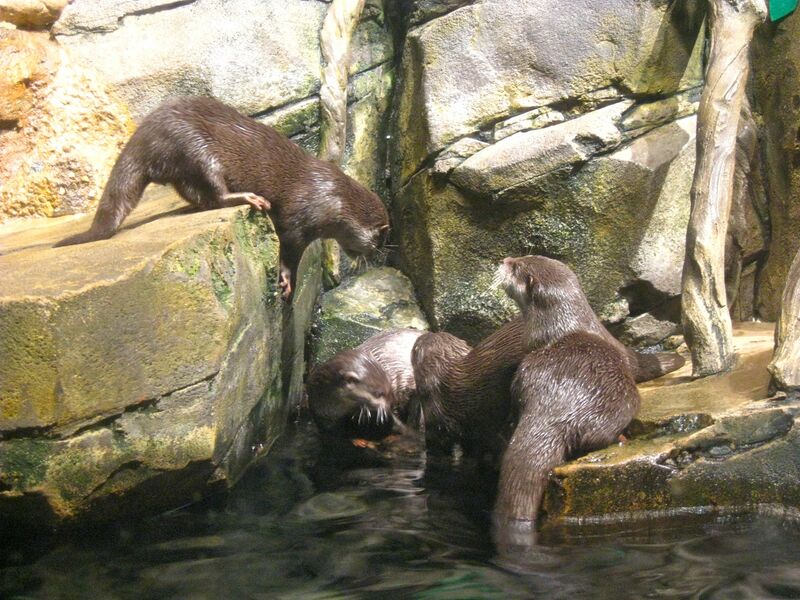 Another inhabitant of the aquarium are the river otters. As a testament to how crazy large this place is there are two kind of otters on display, the other being the much larger California sea otters. All I know is if someone could work out a way for me to take either home I’d be totally ok with it, as they’re very adorable! 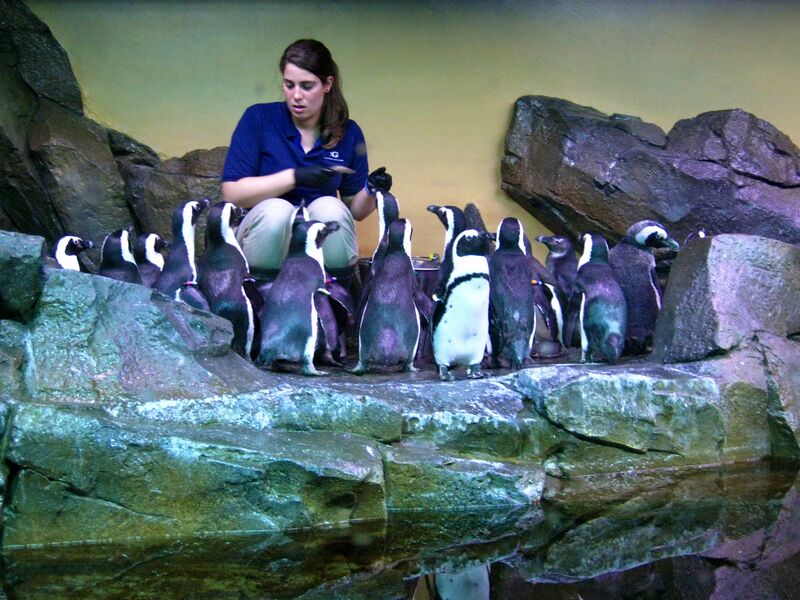 As you might have noticed this post is primarily structured by human reactions I had while visiting the aquarium, starting with “so big I can’t handle this” and working our way to “that guy looks cool/cute/tasty!” But another very human reaction on an aquarium visit came up while watching the African penguins who were getting fed at the time (which, let it be known, I’m kind of sad they’re no longer called jackass penguins). Penguins are cute as they walk on two feet and are immaculately dressed, but wasn’t it nicer when I saw the same species of penguin free in the wild in South Africa? 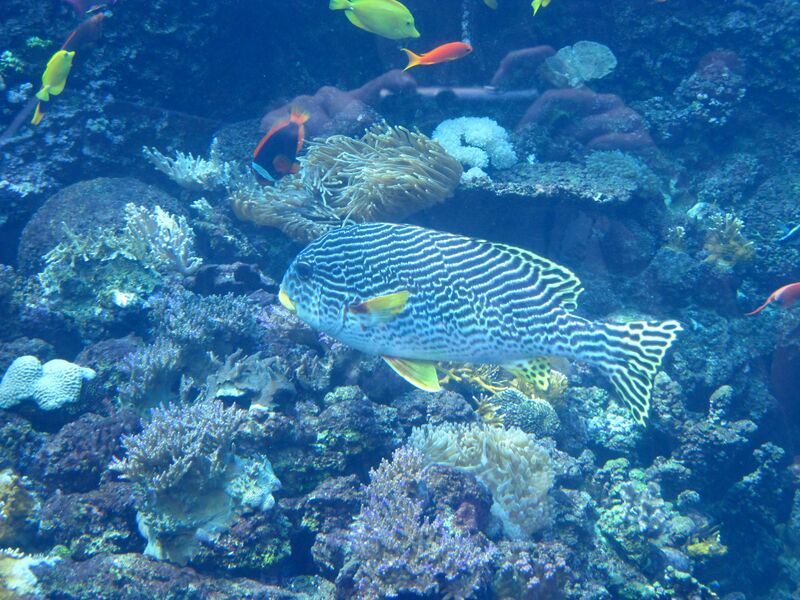 Plus wouldn’t a poor fish prefer to be swimming out free in the ocean instead of its small tank? 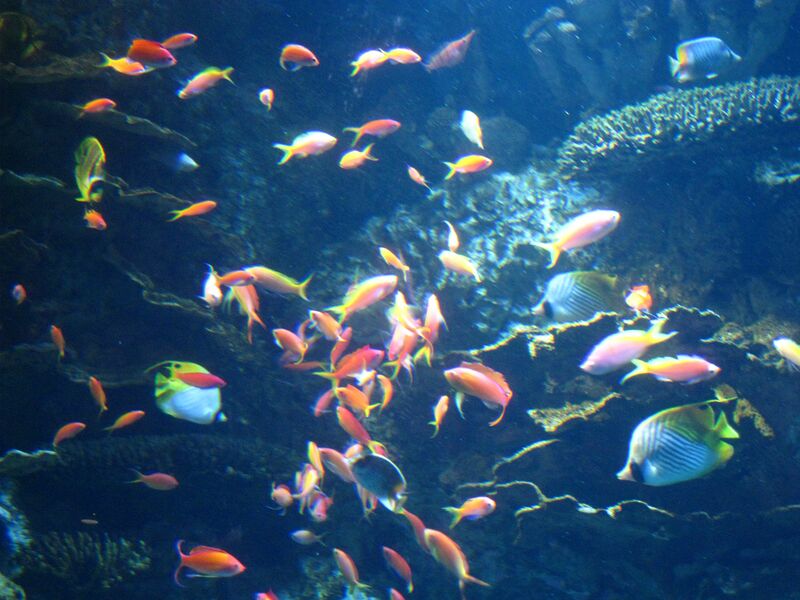 First of all, I think a lot of people I hear upset about zoos and aquariums suffer from an overdose of projecting our own personal wants and needs onto the animal- a fish doesn’t have the same wants and needs as a person after all, so the fish literally being driven to swim around in circles due to a narrow tank do so because they’re fine with doing so. Plus nowadays zoos and aquariums spend an awful lot of time following guidelines for minimum space requirements and enrichment activities and vet care- not all do unfortunately, but most major places these days are accredited by the AZA which oversees zoo standards in the country (you can check their list but as a rule your city zoo is probably accredited, Bob’s Discount Safari Adventure probably isn’t). So when you’re, say, the beluga whale rescued from a Mexico theme park that now gets to live in the Georgia Aquarium, you’re really pretty well off. Captivity isn’t always ideal, but conservation efforts are often dealing with a very non-ideal situation to begin with so we try the best we can. Finally, on a more personal note that hopefully doesn’t disclose how much I listen to my sister talk about zoo ethics and the like (though it’s probably too late! 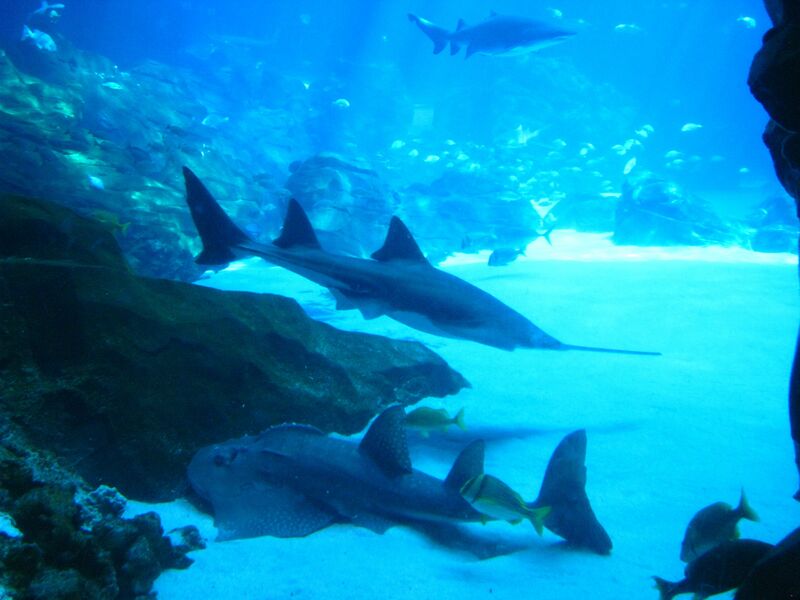 ), a place like the Georgia Aquarium leaves you with such a huge sense of awe and wonder for the underwater world. And we’re talking the majority of the world here- 70% of the globe is covered in ocean after all- most of which is completely unexplored. How many more species will we uncover? We just don’t know, but thinking about the ocean always makes me think of the time I spent working at the SETI Institute. I love how as a species we are out there searching for aliens on other planets, but part of me wonders how we plan to understand them when we can’t understand the dolphins and whales chatting on our own planet. This entry was posted in America (United States Of), Georgia, Science!. Bookmark the permalink. Wow, these are nice photos. I have seen the video of this aquarium and it’s really beautiful. You feel like you’re under the ocean already. Great post. Haha, yes the not getting wet part + lots of fishes is perfect! haha Thanks for sharing again.